The 3am Teacher: BACK-TO-SCHOOL SALE: Everything Will Be Marked Down at My TpT Shop!!! BACK-TO-SCHOOL SALE: Everything Will Be Marked Down at My TpT Shop!!! It's that time of year again & I (along with many others) have marked down my shop the full 20% for the sale!! Use the Teachers Pay Teachers discount code at checkout and recieve an EXTRA 8% off of your total! This only happens once a year, so you might want to get a head start and fill your cart now..
Click the image below to take a trip over to my TpT shop to see what's new AND on sale!! The sale begins tomorrow - just make sure to remember to add the code below when you check out in order to get the full savings!! 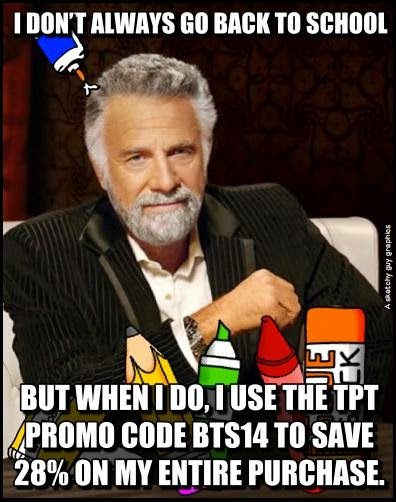 for creating this fabulous TpT Sale meme!! Love it!! Although I do support my family from my online business sales, I know all too well just how hard times can be for many of you. I create high quality free clipart sets as gifts to those who continually support what I do as well as to make sure that everyone can get their hands on free quality graphics! I love seeing what you all create and I am blessed by your continued support and love!! If you are unable to fill up your cart during the sale, make sure to visit my shop, sort my products by most recently added, and have a blast filling up your cart with my recent free graphics sets I have available!! My only request is that you always make sure to leave me some sugar with feedback if you enjoy the free sets!! It encourages me to keep offering a monthly freebie. And that is all.... Have a blast shopping!! I can't wait to see all of your new classrooms this year! OMG! I love your store!! So many cute items!!! AWE! Thank you so much! You just made my day!! You are so sweet Jennifer, thank you!! Sales were great and I just love your blog. I actually saw your link on G+ this morning before I saw this message and the name on your button pulled me in.. haha!